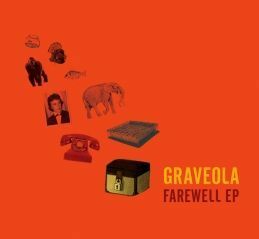 Mais Um Discos have announced the signing of Graveola, post-tropical polyphonic pirates who draw influence from kitsch pop radio and dusty classical vinyls to create what they call “carnival-cannibalism”. The Brazilian group released their 'Farewell EP' this week (11 Oct 2012) ahead of their debut UK show on the 23rd October. The EP will be followed by a full album in early 2013. Mixing the canon of 20th century Brazilian music with folk, jazz, funk, baroque and blues, Graveola combine samba, bolero and bossa rhythms with tropicalia and psychedelic influences. Orignally formed as a three piece, the band began mixing classics of Brazilian music with pop songs, and according to founder Luiz Gabriel Lopes finding inspiration in “lyricism, debauchery and TV jingles”. At that time, their lack of instruments and musical training led them to incorporate housewares and toy instruments into their sound, hence their original name Graveola E O Lixo Polifinco – Graveola and the polyphonic garbage. Around 2005 and 2006 new members joined, their numbers swelled and their sound blossomed and by 2008 they were ready to record their debut album followed by an eagerly welcomed a second album in summer 2012 – which Mais Um Discos has now signed for international release.